On Thursday, April 7, 2016, Jerry Catt, creator of Ivy Brambles Hand Dyed Yarns will be leading the dyeing workshop. Each participant will learn about several methods of dyeing on 100% wool sock weight yarn and will take a completed large skein home with them. Additional skeins and dyes will be available for purchase. Send Elaine an email estimating the type of yarn and the number of skeins you are planning to purchase so that Jerry an estimate of how much yarn to prepare and bring to our meeting. April meeting to be held on Thursday, April 7, 2016. 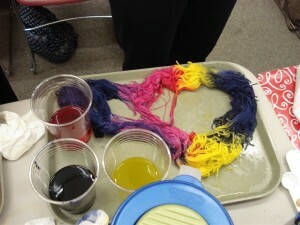 We will NOT be meeting this Wednesday as planned for the dyeing workshop. Our speaker and workshop leader Jerry, cannot make it this Wednesday the 6th due to a sudden death in the family. He will be able to come on this Thursday the 7th and run the workshop. We will still be at St Theresa’s at 17 Still River Rd in Harvard and we start at 7pm.